...recovering the publication history of a single 19th century book. [With permission of The Hyde Park Book Store, Boise, Idaho: "Canadian Alexander Belford, an amazingly precocious child, was orphaned at ten and a book publisher at thirteen years of age. 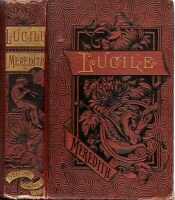 The title of his first book, issued in 1867, is disputed. It was either a reprint of Joaquin Miller's Poems or Hans Breitmann's Ballads. A year later he issued a reprint of Edward Fitzgerald's Rubaiyat of Omar Khayyam. These, it appears, were pirated, as were most of the early books from Belford. In 1873 he started "Belford's Magazine", which his brother Robert eventually managed. 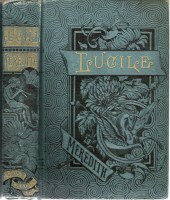 In 1875, he formed a partnership with James Clarke and the following year relocated Belford, Clarke Publishing from Toronto to Chicago. "Together, Belford and Clarke changed the nature of book selling---to the outrage and protests of traditionalists. For example, when a bookdealer refused to carry Belford, Clarke titles, Belford would place the books in the store next door on strict consignment---regardless of the type of store. He opened books stalls in department stores, hardware stores, shoe shops...an idea many decades ahead of its time. In towns too small to support a regular bookstore, he opened temporary stores to clear out backlogs of unsold items at cut-rate prices. This practice became known as "hippodroming." "The company had several major publishing achievements: Belford published Peck's Bad Boy, purchased for $1,000 after it ran as a serial in a local newspaper. Aware that under-funded schools and libraries could not afford the Encyclopedia Britannica, he issued an Americanized version at a fraction of the price. It was such a huge success---the first major encyclopedia to become a fixture in households---Encyclopedia Britannica contracted with Belford to publish future editions of the inexpensive work in England. Belford marketed it aggressively---shocking the sensibilities of the British---with payment plans, subscriptions services, and glaring newspaper ads. This enterprise led to the founding of the WESTERN BOOK AND STATIONERY COMPANY to handle the accounts and distribution of the encyclopedia one volume at a time. This spawned off the TIMES BOOK CLUB. "New partners joined, if only to help count the huge profits that were rolling in. Clarke's brother George came on board. Then Horace "Hell Every Hour" Hooper joined. 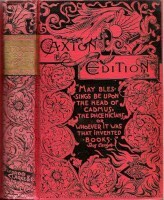 The 11th edition of the encyclopedia was directed by Hooper who was also a super salesman; for example, he sold the encyclopedia to Cambridge University by promising to place the university's coat of arms on the title page of every volume, thereby giving generations of readers the false impression Cambridge had something to do with the publishing of the work. Another partner was Walter Jackson, a book dealer from Boston. Jackson and Hooper attempted to pirate the 11th edition back to America, but the new copyright laws prevented that, so they re-issued it with new plates in a special American Edition. "Jackson then purchased the rights to Harmsworth Children's Cyclopaedia, which he re-issued in America as The Child's Book of Knowledge, the most successful subscription book in history. Clarke next purchased the rights to the Century Dictionary (see 1870---Century) which he re-issued as the Century Dictionary and Cyclopedia, added a two volume atlas, and sold it all as a 12-volume set. Clarke used the technique of advertising that at a certain date the price would be increased, then promoting it ruthlessly: THREE DAYS BEFORE PRICE INCREASED!!! TWO DAYS BEFORE PRICE INCREASES!! !, etc. And he always raised the price, at which time he would announce the second price increase and start the campaign all over again. "Everyone connected with Belford, Clarke was getting rich and richer, but the end was in sight. First, a major fire wiped out inventory and forced Belford to default on deliveries of books. This plus the panic of 1893 forced subscribers to default on payments. Despite heavy cash flow, the bad debts began to increase until banks stepped in to protect their investments. Belford could have fought, perhaps, but he was getting old and tired. He and his partners decided to call it quits and to divide the assets. Clarke established a firm to handle the Century Dictionary, Jackson took ownership of the Book of Knowledge, and so forth. Belford merged his share (worth over three and a half million dollars) with R.S. Peale and Company to form WERNER COMPANY, which he managed. Werner company would eventually become SAALFIELD (see 1891). In 1900 Belford retired to California where he died in 1906." The Lakeside Chicago directories have not been systematically checked, but the 1890-1892 entries locate the company at 109-111 Wabash and notes Alexander Belford as president (home 832 North Park Avenue) and George B. Hammond as treasurer. There are no entries for 1894 and 1896. In 1897 and 1898, Belford, Middlebrook & Co. are located first at 160 Adams and then at 279 Dearborn. In 1899 Alexander Belford is listed 279 Dearborn, home 832 North Park. In 1900 and 1901 Alexander Bedford & Co., 279 Dearborn, is listed among publishers in the classified section. There are no entries in 1902 and later. 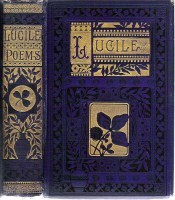 1885 PTLA: Red line edition of the poets. 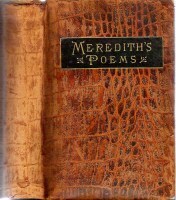 Without doubt the finest and most complete edition of the poets ever issued in this country at a low price. 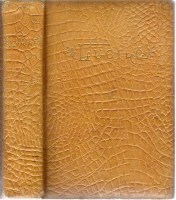 66 12mo volumes, illustrated, handsomely bound in cloth, black and gold, gilt edges... Prices, per volume, handsomely bound in cloth, gilt edges, $1.25. 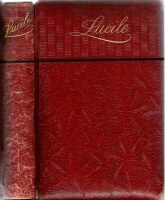 [Selected titles, including Lucile, offered] bound in alligator, in box, price $2.50. 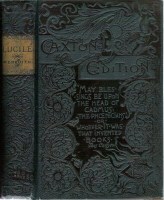 1885 PTLA: Fine edition, 12mo, handsomely bound in cloth extra. Made specially for those who want a neat, plain book at a moderate price. 27 volumes, price $1.50. 1886 PTLA: as 1885. 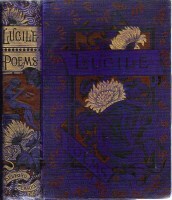 (Lucile is #259; Poetical Works #260). 1887 PTLA: as 1886. 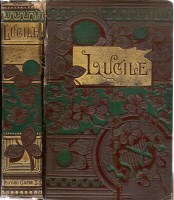 (Lucile is #225; Poetical Works #226). 1888 PTLA: as 1887. 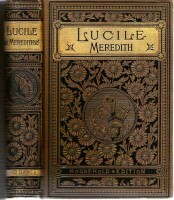 (Lucile is #341; Poetical Works #374). 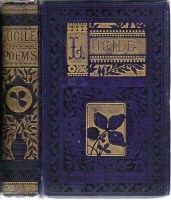 Gilt Edge Poets. 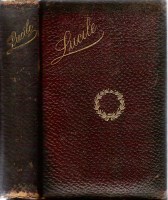 1886 PTLA: Gilt edge edition of the poets. 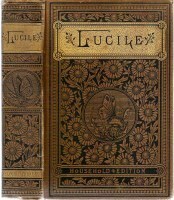 The finest and most complete edition ever issued in this country. 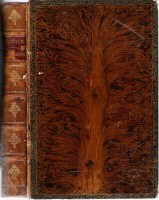 Fifty-nine 12mo volumes handsomely bound in cloth, black and gold, gilt edges. Price, per volume, $1.25. 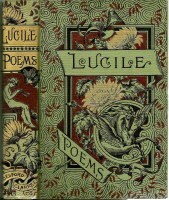 (Lucile is #191; Poetical Works #193). 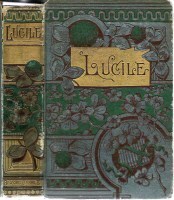 1887 PTLA: as 1886 except "fifty-eight 12mo volumes..." (Lucile is #159; Poetical Works #161). 1888 PTLA: Illustrated. 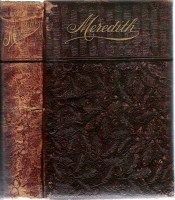 The finest and most complete edition issued in this country. 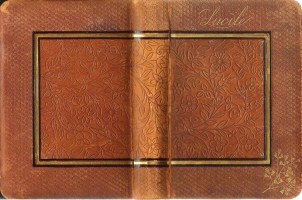 Handsomely bound in Cloth, black and gold design. Full gilt edges. Each volume, price $1.25. 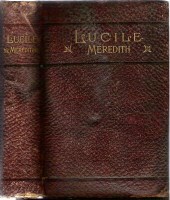 (Lucile is #339; Poetical Works #372). 1889 PTLA: Illustrated. 12mo, Cloth, Each $1.25. 1888. Chicago, New York and San Francisco. 120x190mm, 369p. Frontispiece portrait, otherwise not illustrated. 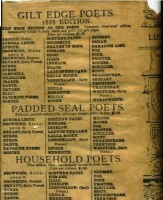 Verso of title page: Advertisement (arranged inside a circle) for Belford's Magazine. Red line pages. 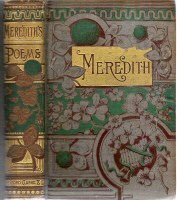 Brown cloth stamped black and gold; pegasus lower right, Pan on spine, "MEREDITH" in lower left (same stamping as BC4a,b); aeg. Floral endsheets. BAP BC5 copy 1 and copy 2; University of Alabama (NL 0594621). Also (details not verified): NL 0594621 University of Illinois N; Harvard; Oberlin YY. 1886 PTLA: Full seal, padded covers, price, in box, $2.50. 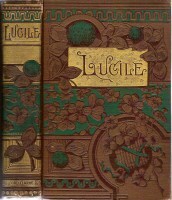 (Lucile is #235; Poetical Works #236). 1887 PTLA: as 1886. 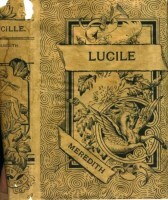 (Lucile is #201; Poetical Works #202). 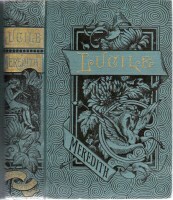 1888 PTLA: Padded Seal Binding with elaborate design. Each Volume in neat box. Price $2.50. 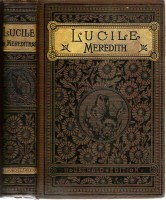 (Lucile is #340; Poetical Works #373). [Tree Calf (faux)]. None of the editions described in PTLA are offered in tree calf, so this copy, very likely in a binding roughly contemporary with its printing, may not have been issued by Belford & Clarke. It is, of interest, however, as the tree calf panels are in fact printed sheets. Note the front and rear boards are identical, a result impossible to achieve with the boards are individually decorated. In this case, even the border "rolled in gold" has been printed; and in fact the roll pattern at top, bottom and foreedge has been continued on the sheet so it decorates both the edges and the turn-ins -- an extraordinary extra effort to make! 1889 PTLA: We wish to call particular attention to the fact that this line contains a great number of fast-selling copyright books, and that, as a whole, it is the best selling one now on the market. 150 volumes, 12mo, cloth, each 50 cents. © Sidney F. Huttner 2010. All rights reserved.